Mocha: Yemeni government forces captured on Monday the key port of Mocha as they pushed to oust Iran-backed Al Houthi rebels from the Red Sea coastline, an AFP journalist said. The Iran-backed rebels have received weapons shipments from Iran through this port and liberating it delivers a major blow to the militants. Government forces were combing the port, a journalist accompanying the troops said, almost three weeks after Yemeni forces launched an offensive against the rebels and their allies on Yemen’s southwestern coast. An official statement said government forces recaptured the whole city, but a military commander in the field told AFP that the army was still fighting the rebels on the southern outskirts of Mocha. Mocha has long been famous for its seaport where the country’s internationally-renowned coffee is shipped from. Yemeni forces fighting in support of Abd Rabbo Mansour Hadi, the internationally-recognised president, launched a vast offensive on January 7 to retake the Dhobab district overlooking the Bab Al Mandab strait, a key maritime route connecting the Red Sea and the Indian Ocean. Fighter jets and Apache attack helicopters from a Saudi-led Arab coalition have been pounding the rebels in support of pro-Hadi forces, military sources said. Al Houthis have controlled Mocha since they overran the capital in September 2014 and advanced on other regions aided by troops loyal to ousted president Ali Abdullah Saleh. The coalition mounted a military campaign against the rebels in March 2015 as insurgents closed in on Hadi in his refuge in the southern city of Aden and forced him to seek exile in Riyadh. 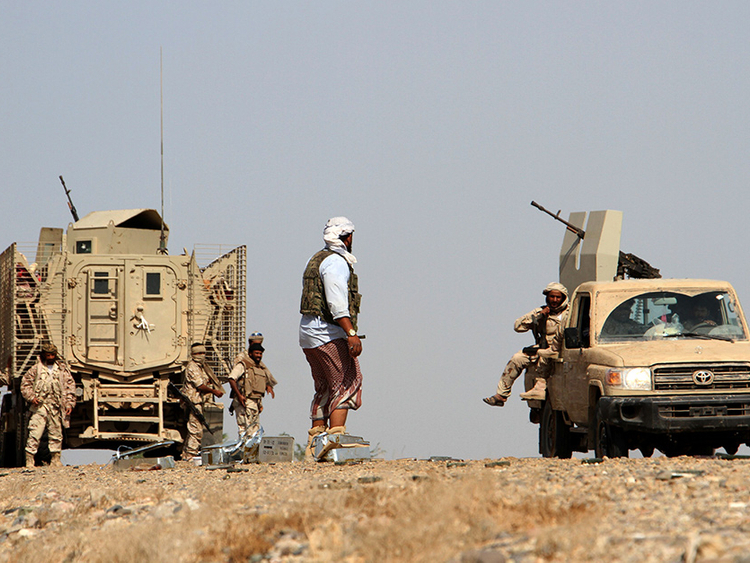 Yemeni forces have since drove rebels out of five southern provinces, including Aden. The militants have endured heavy losses since Operation Golden Arrow was launched two weeks ago, aimed at liberating the entire Taiz province and cutting off Al Houthis’ arms supplies. On the political front, UN special envoy to Yemen, Esmail Ould Shaikh Ahmad, arrived in the Yemeni capital on Sunday to push for a new round of peace talks between the internationally-recognised government and the rebels. Ould Shaikh Ahmad is expected to meet with senior leaders in the Al Houthi delegation as well as Saleh’s party. Last week, he briefly visited the port city of Aden where he suggested a new roadmap to Hadi and his government. Under the new plan, Hadi would retain his powers as president until Al Houthis fully withdraw from occupied territory and disarm.